The first piece on their program is Le Fontane di Roma, The Fountains of Rome, by Ottorino Respighi. Any Roman will tell you that living in Rome is kind of like living in a museum that’s open 24 hours a day, every single day of the year. A chief attraction at the grand museum of Rome is the Fontana di Trevi – the Trevi Fountain – the most famous of Roman fountains. It’s pretty much always crowded there. But it’s one of those things that, when in Rome, you simply must see. It’s unimaginable not to see the Fontana di Trevi, and unimaginable not to toss a coin over your shoulder into the fountain, thus guaranteeing your return to Rome, according to tradition. So you put up with the crowds. But that’s not my favourite Roman fountain. My favourite Roman fountain is so commonplace there are 2500 exactly like it scattered all over the city. It’s like an old friend that you stumble upon down a winding alley, after you’ve gotten happily lost in the back streets of Trastevere – you’re parched from hours of wandering in the heat – and there it is – the nasone – the humble drinking fountain – carrying pure clean Roman water, the same water the Ancient Romans drank and brought to the city with their aqueducts two thousand years ago. 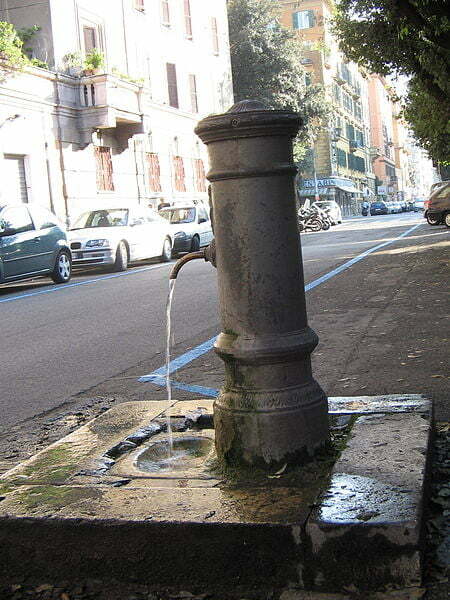 Whenever I get a chance to hear The Fountains of Rome, I like to spare a thought for those little fountains, along with all the grand baroque fountains that inspired Respighi. By the way, nasone means big nose. It’s the colloquial name for these fountains. I think Gonzo would agree that it’s the perfect name. Thanks to Carlomorino for the photo of the nasone fountain.